This is our very own Yves (Yves and Michelle) and Rusty swinging out at the Eiffel Tower. Yves and Michelle took Rusty for a day of site-seeing in Paris during her Europe trip. "Practice is a means of inviting the perfection desired." I had a GREAT month away from home, visiting France, Spain, and Norway. I have written a brief summary of my trip under Added Attractions, and I have added a scrapbook page of my trip for your viewing pleasure (click HERE). Thanks to all your wonderful Rhythm Pals everything kept going in my absence. Please accept my thanks once again: Thanks to Ron, for teaching the Tuesday nite classes (I can't wait to see all your new moves). Thanks to all the Rhythm Club volunteers for keeping that night going: Jessica, Capt Fun, Julia, Teresa, Debbie, Hilja, Nathan & Crystal "The Sweethearts of Swing", Robert "The Professor" Vangor, Mike, Jon, Jamie, Sharlene... and anyone else who pitched in. THANK YOU FOR SUPPORTING THE RHYTHM CLUB!! RICHMOND STREET FAIR -- VOLUNTEERS NEEDED! -- CAN YOU HELP? Every year, we get invited to have a booth at the Richmond Street Fair and do a performance/class on the stage. I am waiting to hear what time our stage slot is... so stay tuned. I had the wonderful opportunity to take a month long trip to Europe this past August. 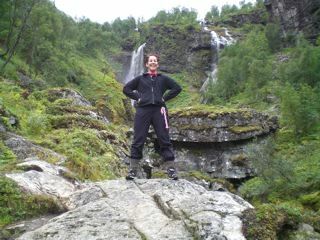 I was invited back to teach two tap dance weekend workshops in Norway, so I thought I would add on some vacation time. I started out the trip visiting my cousins in Normandy, France. My cousin, Bud Korengold, was a journalist and following that, a in the U.S. Diplomatic Corp, all this from the mid 1950s through the 1990s. He and his French-born wife had amazing stories to tell about their lives in Soviet Russian, England, France, etc., throughout these years. 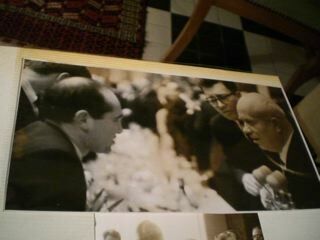 Here's a picture of my cousin Bud with Kruschev! After a few delightful days with my cousins, I took the train to Paris for a three-day stay there. I was hosted by a lovely French Lindy Hopper, Caroline Monhaud. (Remember, once you lindy hop, you have hosts all around the world). My first night in Paris, she took me to the Lindy Hop dance that's held weekly on the banks of the Seine. Wow! Two of our local dancers, Yves and Michelle, were there, too. 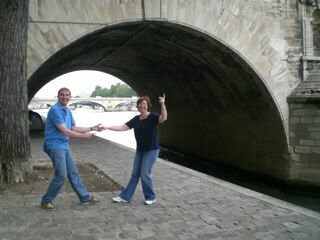 The next day, Yves and Michelle took me siteseeing all around Paris, including a boat ride on the Seine. Next stop, Spain. I took the fast train down to San Sebastian, Spain. And, boy oh boy, do I mean fast. It goes 300 kilometers an hour. There I was hosted by local Lindy Hop enthusiasts Ana & Paxti. They took me siteseeing every day. It was amazing. Then, back up to France and back with my cousins for a couple of days before moving on to Norway. Despite all the broo-haa-haa at the airports, I had a relatively painless flight from Paris to Oslo. Met at the airport by the tap festival organizaers, I spent the next four days in Oslo siteseeing, and teaching an enthusiastic group of tap dancers throughout the weekend. My cousin, Bryan Torfeh -- who is a professional actor and all-around good fellow residing in London, England -- met me in Oslo and we spent the next four days taking the train west across Norway to Bergen. My eyes couldn't believe what they were seeing! It was art! Bergen was the last stop -- and it was pretty much a replica of Oslo, siteseeing, teaching, and having a great time. I just wanted to let you know that I made it to Bud and Christine's and that everything is fine. The journey was long, and once in Paris, I took three trains to get to Bud's. I kept thinking of you, Mom, and how you always say how brave I am to travel on my own like this, and at that moment, I agreed! But at last, I got to Bud's town, and, of course, there he was smiling at the station. He gave me a quick driving tour around his area and then to his beautiful home. Their son, Kevin and his wife are here too. So we are all having a good restful time. Christine made a wonderful meal last night, very French.... ending with cheese and an apple torte. She is now downstairs preparing lunch, and my little stomach is grummbling. So all is well now. I will try to write again tomorrow. For now Bud and Christine send their love! P.s. It is very hard to type because the A, M, W, Q and other keys are in alternate places! Had a great day yesterday; Bud and Christine took me to the Normandy coast, Honfluer and also Deuville. They kept thanking me for getting them out, as they only go for little holiday days when they have guests. Though it threatened rain, it was lovely all the time. These two villages were really the image of French villages. I took so many pictures, I know my flash card is going to run out really soon! Today I leave them for Paris, so chapter two of my adventure begins. Today I leave for Spain. At least I hope. It turns out that today is one of the biggest holidays of the year and everyone travels. My host is not on vacation so she totally forgot about this, and when we tried to book the ticket online last night, she remembered when each train time said "sold out" next to it. So cross your fingers! I am hoping that since I am just one person travelling there will be hope. I had a great time in Paris. I did all the touristy things you do here: saw the Eiffel Tower, took the boat tour around the Seine, went up to Monmartre, had dinner in a little cafe, lunch in a little cafe, just no breakfast in a little cafe. I walked until I got shin splints and then walked more. I even got to go to a swing dance that is held weekly on the Seine... there was a moon and everything! I have taken more pictures than anyone would want to see, so I'll have to sort through them and make one of my little books. I am really excited about seeing Spain. My first time there. My hosts are a lovely couple I met in Sweden at the dance camp there years ago.Since that time, he had a car crash and is in a wheelchair (so sad). He still participates in the swing world by djing. Still, it breaks your heart. To think, I was that close myself! I hope this finds you well. I expect an newsy email on my desk next time I go on line! I had a really nice two days. Took the train from Paris to Hendaye (France) where my friends Ana and Paxti where there to pick me up and drive me to their village in Spain (about twenty minutes away). My childhood Spanish isn�t helping much here as everyone speaks Basque, or Spanish with a Spanish accent, a lot of lisping. No one speaks English. I am staring a lot! Last night Paxti and Ana took me to San Sebastian and we walked all around the old town (look it up on Google, it�s beautiful). Today was a quiet day, but tonight we got together with about ten of their friends for dinner at a really nice resteraunt. Tomorrow they are going to take me siteseeing and then the big festival of San Sebastian begins. Paxti is in a wheelchair. He had a car accident Jan 1, 2004, and is a parapalegic. It is something to watch how he has to get around. They have t his gismo to get him up a flight of stairs (their place has no elevator, they are moving soon), that is like a Sherman Tank. Boy oh boy. How are you and Mom doing? I have only heard from you once since I have been away (and that is ONE week). So get on the keyboard and get with it, both of you! Well I made it to Norway just fine today. My new hosts were there to great me at the airport with a rose and big smiles and hugs. They are sooooo excited to have me here. They go on and on about how thrilled they and all their students are to have "The Shim Sham Lady" here (apparently they all learned the Shim Sham from me on the tapes/dvds!) The teacher/organizer is especially excited because she loves my style of dancing so much, how I really perform, and in the classic style now referred to as "swing tap". So I feel very encouraged from the get go. Cross your fingers that my knee holds up. It's not feeling too stable, so I plan on wearing the brace throughout classes. I arrived at 3:00, so there was plenty of daylight time for siteseeing. They took me up to the mountaintop to an old chalet style restaurant that overlooks all of Oslo. We sat outside in the warm sun and enjoyed the view and chatted up a storm. Next we dropped my stuff of in the apartment where I'll be staying. It is an old and large apartment, very artsy, owned by an actress and delightful woman, it's big enough for the family. Then they took me out for a long walk in the famous sculpture garden, then to a wonderful outdoor cafe for dinner. We then did some grocery shopping, and I had a delightful time looking at all the shelves with foreign foods, yum yum. Then we came back to my host's apartment and we chatted for a long time. I am really happy now. The workshop is fully booked, and the atmosphere is great. Tomorrow I have a free day, so my host is taking me siteseeing, then I start the classes in the evening. So, I feel good, healthy, and quite happy. I hope this finds you well, and now it's your turn for a newsy email! You are so wonderful to torture yourself and sit at the computer and write your little daughter. I know what a pain it is for you to go through the agonizing process of emailing. Maybe it gets easier with each email? Yesterday was just as good, if not better, than the first day of classes. I have three levels, three classes each day - beginngers first, then the intermediates, then the advanced, which is mostly made up of dance teachers. I call the last class my dessert! They are so much fun and no struggle at all. Each of the three classes are eating up the material. I also take some time to show them tap clips to introduce them to some of the greats and some of the different styles. Yesterday we watched some Fred Astaire clips and, of course, some clips from my new Louis DaPron and Miriam Nelson clips (each of those has archival clips from old movies in which they danced). I love watching their reaction to thiese. As Lena Lamont says, "It makes me know all my hard work ain't been in vain for nuthin'!" Bryan arrived yesterday at noon and was fetched from the airport by the boyfriend of the festival organizer (have I mentioned enough how nice everyone is here and how well they are taking care of me!). They brought him directly over to the dance school so we could say hello, and they dropped him off at the apartment where I am staying. He got a good little rest, and then when classes were over, we all met up and took a walk in the sculpture garden, Vigelandsparken. It was quite a different weatherwise from my previous walk (which had been bright, sunny, and warm) -- ours was overcast, rainy, and muggy. So it was as though we were looking at everything for the first time... in a new light, so to speak. I suspect you could walk through that park a hundred times and still see new things, new expressions on statues' faces. After that, we met up with the teacher class for dinner at a restaurant called "Curry and Ketchup" -- as Bryan would call it, "a cheap and cheerful" Indian restaurant. It was great fun hanging around and getting to know the students. Today is the third and last day of my teaching here. Thankfully, my knee is holding up. I have the brace on, I am taking plenty of ibuprofen, and taking little rests when I need to -- the students are very understanding. I just looked out the window, and I see the sun peaking through. I will cross my fingers that the clouds get pushed away so that when Bryan and I begin our trip tomorrow, we have clear skies. We have been getting plenty of good suggestions for our trip. It looks like we will start tomorrow by train to Mrydal (about five hours), then take the historic Flam railway down into Flam. This is considered one of the most scenic railways in the world, steepest and most scenic. I am sure you can find a little something on the web about it -- just type in "Flam Railway Norway". We are thinking of staying in Flam for two nights and enjoying the local activities, then taking a boat through the Fjords, and then a short busride to Voss, then the train to Bergen. Oh boy oh boy. Funny, Bryan is just like I was the first days of my vacation... in shock at relaxing. It's always such hard work getting everything done before leaving town. Well, that's it for now from Norway. Write again soon! I love coming back to your emails. After tomorrow, I don't know how easy it will be to check emails for a day or two, hint hint. This is just going to be a quick message to let you know that I am okay. I couldn't get to the internet while traveling across Norway, but now I am safe and sound in Bergen and there is free internet access in our lobby. It's really late at night now, and nobody is waiting, so I can dash off an email to you as long as my eyes stay open. Well, I've had a terrific and exhausting and relaxing time with Bryan travelling across Norway. We started out by taking the scenic train across from Oslo to Geilo, stayed over night there. We got there in plenty of time to have a full day and we decided to go horsebackriding. We walked about a mile to the stables and two young Norwegian girls took us out on a most stunning trail. We actually rode Icelandic ponies. They were so cute, and sooooo easy to ride. They had the smoothest gait I've ever experienced. It was wonderful. 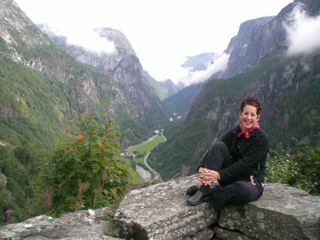 The next day we took the train to Myrdal, then the scenic train (considered one of the world's most scenic) to Flam. Unfortunately, our first train was delayed, so there were hundreds of people waiting for the small train to Flam, and we ended up standing in the festibule all the way down, so we asked for and got a free ticket for the following day to go back up. That night we rented bikes at our hotel, which overlooked the Fyord, and rode around the area. Just beautiful. The next morning we caught the train back up (this time comfortably seated) and then rode bikes all the way down! 22k!! It was phenomenal. And, the best part was that I didn't break my legs, or any part of my anatomy!!! Phew. We then went to our room and completely collapsed. Oye vey! Got up for dinner and a short before bed walk. Today got up early and caught a boat that went from Flam to Gutenvagen, took two hours and was lovely. Then took a scenic (notice the scenic repetition) bus up to Voss. We hung around Voss for a walk, though the weather wasn't good enough to do any of the things we had wanted to do. So we had a Chinese dinner, then boarded a train for Bergen. What a ride. This country never ceases to awe me. We arrived in Bergen at six, checked into the hotel, which is right in the old town, then took a nice long walk around. We took the vernicular up the mountain and then had dinner there. So that's it. Tomorrow, I begin the second round of teaching. I am back on line, so hope to hear from you both soon. I am so frustrated, I waited all night for the computer and finally got it, and now someone else is waiting. I feel their eyes on my back waiting for me to finish! So I will have to keep this shorter than I had hoped. Anyway, there is not much to tell you as the weekend started and it's much the same as the last one. The same exact schedule of classes, same good reception. I can tell I am a little more tired than before, as this is like de ja vu again. But I am trying not to let them notice this. I am doing my best to keep my energy up and be very lively. Everyone seems quite happy. Tomorrow is the last day of classes. I leave the hotel and move in with a family for a couple of nites. Monday I will spend with the teacher who arranged this entire tap event, Vibeche. She and I are going to go siteseeing by the coast. I am looking forward to spending time with her, a whole day. Will be nice. She seems VERY pleased with the weekend. Then on Tuesday, "The Family Four" (a family of four, two parents and two daughters who take Vibeche's classes) are going to take me out for a day of siteseeing to see the estate of Ole Bull (see Google). Looking forward to both days. Then Wednesday will be quite a day. I fly from Bergen to Oslo. Oslo to Paris. Paris to LAX. Oye Veh!!!!!! Bryan left this morning, so I was all on my own this evening, which was really quite nice after a full two days of teaching groups of people. I walked around the fisherman's wharf area and had a really lovely time. Turns out my hotel has a terrace on the 7th floor. You can sit there out in the fresh air and overlook the entire wharf area. I brought my book up there this evening and spent some nice time after my walk. So that's the news for now. Today was a really lovely day. Vibeche picked me up in the morning and drove me all the way up to the tip of the islands ro the west of Bergen. I really got a chance to see that rugged coast line. We then went to an ocean museum and saw, just the two of us, a film on the history of this coastal area. Was really interesting. I enjoyed the day very much. Then we came back and I did a little shopping, just some thank you gifts (candy bars and such) for all the volunteers who helped at the club in my absence. Came back to the house, and the kids were all waiting for "The American Lady". I had a nice entertainment of music (they played a concert on cello, violin, and violin) and then saw videos of the girls iceskating. This family is so sweet. I have a computer righ tin my bedroom! I moved from the hotel yesterday to a family's house. They are lovely. Had a homemade dinner waiting for me when came back from the end of the workshop. They live in a 1925 home, nice and cozy. Have three adorable kids, 5, 9, 11. And the 11 year old is the spitting image of Sara. She even speaks English already (they start at 8 here!). Last night was really like going back in time, the oldest girl and I played duets on the piano, they brought their two guinea pigs out for me to see, the little 5 year old brough his baby book out for me to see. So even though we couldn't talk with words, we had such a nice to time playing. Today Vibeche (the weekend organizer) and I are going to spend the day together. Finally. We haven't spent any time one-on-one since I got here on Thursday. So we are both looking forward to that. We're going to take a drive and just hang out and visit. Tomorrow the Family Four is taking me to Ole Bull's house. Only the parents, as the two girls will be in school. Maybe I'll see them after. Ole Bull is a real national treasure here. Apparently he spent a lot of time in America as well. Click HERE to see pics from Rusty's European trip 2006. Last year swing dancers raised over $52,000, an impressive number for any first year charity event. This year our goal is $100,000 Check it out!